Guest posts didn’t stop just because the calendar flipped from August to September. Today, Susan from The Royal Cook, is here to share her edible cookie dough recipe. Hello Just Us Four readers! I’m Susan from The Royal Cook and am thrilled to be guest posting here today! I am a mommy to 5 (yes 5!!) and in my spare time (ha ha!) I blog about what comes out of my kitchen. My kids, especially my girls, can’t seem to get enough edible cookie dough. I make it for them at least once a week, if not once a day! For those of you who are not huge chocolate fans (is there really such a thing?!? 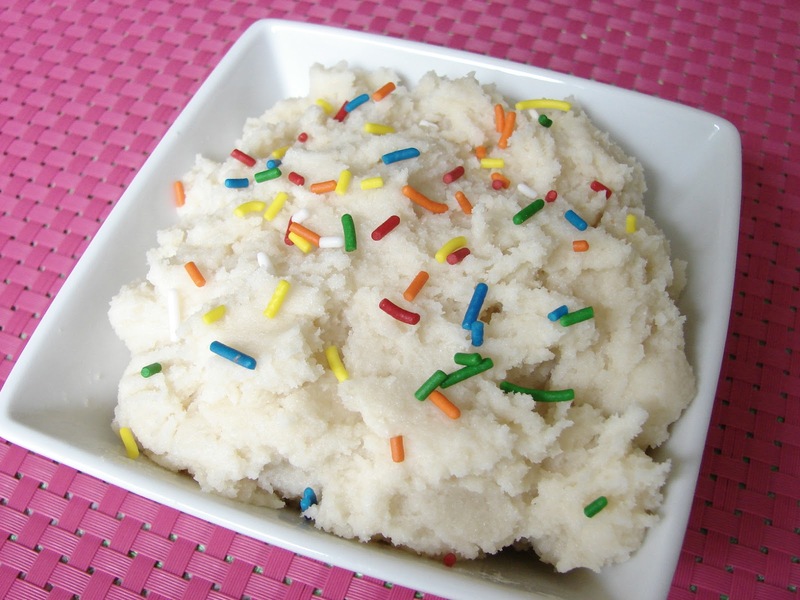 ), so aren’t really into my Edible Chocolate Chip Cookie Dough, try out this Edible Sugar Cookie Dough. And even if you are a huge chocolate fan, still try it out. It’s delicious! My 12 year old and her bestie have decided they like it even better than Edible Chocolate Chip Cookie Dough. That’s pretty big. Especially if you’ve ever seen the way they devour the stuff! Combine sugar, butter, vanilla, orange extract and milk. Mix well. Add flour, baking soda and baking powder and mix until combined. Recipe from The Royal Cook – an original! You can find me on Facebook and Pinterest. I’d love to have you follow along! I’ve got some kind of crazy sweet tooth going on right now so I’m going to try this tonight! Ok so I made it and it was SO good! I have raw sugar and whole wheat flour but it still tasted delicious. I don’t have chocolate chips so I added maybe a tablespoon or two of cocoa powder and it is SO good both ways! Thanks for the recipe! I’m pinning it now so I don’t lose it! This looks so good. I can’t wait to try it in our house. Oh, the idea of raw sugar and whole wheat flour is a great one! I might give that version a try too! Haha…I definitely get a sweet tooth in the afternoon so you see a lot of sweet stuff around here.